Hello everyone. I have a “new to me” Golding Pearl #3 that is having a clanking issue that I do not think is good or safe for the press. 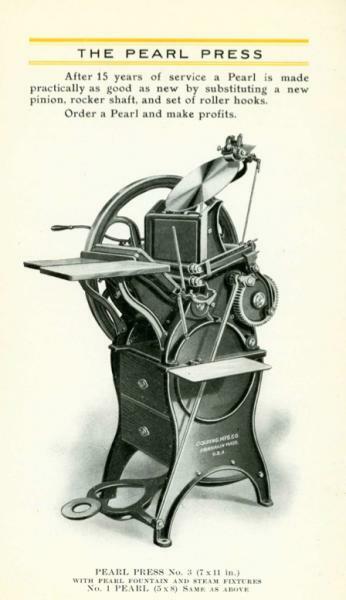 The press is printing fine BUT a loud clanking sound happens just at the end of the rotation, when the rollers get to the very top of the ink plate and start rotating back down the press. My press is also a bit on the shaky side, which is odd for such a large piece of equipment. We did a thorough inspection of all oil holes and I have been oiling properly with the exception of one hole that I missed. This video was taken after oiling that final hole and running it for a little while to hopefully let the oil sink in. I have only been operating this press a few times over the past 3 weeks. My husband was kind enough to shoot this video so that you can hear and see the press as I run it with the flywheel. Unfortunately, neither of us know enough about presses to troubleshoot what is happening. My husband is mechanically inclined so he did look at all of the joints and the gears don’t seem to be missing teeth or anything. We would be grateful for any assistance. If you need to see close-ups of a specific press part or additional video - we would be glad to provide it. We just want to have her running safely. With the Pearl the frame is in several pieces bolted together, and if those bolts are loose that could explain the “shaky” condition and possibly the cause of the noise. Note also that when the rollers are at the top of the ink disc the platen is completely closed at maximum impression. If the small gear that drives the large gear is worn or loose on its shaft the clanking will occur as the press goes “over center” on impression. If you are printing hard (to get deep impression or full coverage of a large area) you are stressing the press in a way it was not designed for and the clanking is a warning that things could break. Pearls are not strong enough for that sort of work. However, if the press makes that noise when there is no form in the press, there could be a serious problem. Check carefully for the location of the clanking noise. With heavy impression, Pearls typically break the large bearing of the frame that holds the shaft on which the platen rocks back and forth. Make sure there are no cracks in that area. Thank you so much for getting back to me. I will have my husband read this over and look at the gears. I will also check again to see if the press is making the noise when I do not have the form in. My packing is as follows: Top Tympan sheet, 1 piece of red pressboard, 3 Tympan sheets - do you think that is too much? I would not say that I am getting a deep impression, but I do like more than a kiss. I could remove a sheet and see how the press reacts. As far as the coverage area - I am doing pretty small work so far that is like 3 inches or less for greeting cards, ect. I will also look for cracks near the shaft. Just keep in mind that when the Pearl was made — and you have the early model — kiss impression was the rule. The press was designed to just transfer ink to paper, not to make a dent in the paper as well. Also the rule of thumb is for most platen presses, the area you can safely print is about 1/4 of the chase area, so no more than about 3-1/2 x 5-1/2 inches of printed area (not paper size) with kiss impression. I bought two Pearl 11 Improved presses, both of which had been broken in the area I described and one, the one I made into Frankenstein’s Monster by combining unbroken parts, had been repaired but probably not 100%, so I try not to stress it. So just be careful about how much area and how hard you hit it, if you want the press to last. I really appreciate the feedback, thank you. We are getting ready to head over to the shop now and try to figure this out. I will remove the packing completely to see how that goes, that might be my issue. I’ve been working on fitting a treadle to a friends Pearl. On Friday we were rotating the press and noticed this very same clanking noise. You can actually feel it as feed back through the treadle. We looked carefully at all of the gears and fittings, but not the large frame bearing that Bob speaks about. the video posted demonstrates the exact same problem. It seem to happen every three cycles of the the shaft. All of the gears seem to be tight. The friend who owns the press has only used it twice, we don’t know much about its history. Any additional thoughts and pix would be greatly appreciated. On most of these old presses the gears are worn, probably as much from lack of oil as from a lot of use. When you are running the press, as it closes the gear train (small gear on the flywheel shaft meshing with the larger gear) is pulling the press closed. (The every three cycles of the flywheel shaft is because the gear ratio is about 3:1, so 3 revolutions of the flywheel turn the press over one cycle.) When it closes all the way and prints there is some resistance and the gears suddenly shift to meshing the other way (on the opposite face of the teeth of the gear) and depending on how much play there is you will hear a clunk as they switch, louder under more load (heavier impression). This is basically normal for an old press. But if you are working the press hard with heavy impression or a large form, the clunk will be louder, and it’s basically telling you that you are stressing it. I suggest that you make up a type form that is about 1/4 the size of the chase (so for a 7x11 that would be about 3-1/2x5-1/2) and print it with just enough pressure to get a decent print on smooth paper like bond, without denting the paper. The sound of the gears should be minor but noticeable. A larger form, or bolder type, or a dark cut, will require more pressure to print well and the clunk will be louder. The danger is that you can’t tell for sure at what volume of sound the press is endangered, so you want to be conservative in stressing it. I believe the shaft is oscillating slightly causing the solid part of Pinion to make contact with the teeth of the main gear. If the fly wheel and small gear have a slight gap, as the rotation goes through its cycle, it moves enough to make contact, I have 5 presses here and 2 of them have a space washer between the small drive gear and the frame. I took out the washer and found after a few revolutions the press was performing like Brandi’s video. Try the Washer. It may not be the correct fix, but it works. Maybe the main gear slipped from its original position away from the frame so the tolerance for oscillation of the treadle shaft have been compromised. John Falstom would know more. Thank you so much to Peter (petspo1) - this totally worked! I was able to get a 7/8” x 1 3/8” washer at my local Lowe’s and once installed, the clanking was completely gone - yeah! By the way - I bought my beautiful press from Peter and I believe he has several other presses available if anyone is in need of one. I recommend Peter 100% as he has been AWESOME before, during and even AFTER the arrival of my press. I couldn’t have asked for a better seller. Thank you SO much again Peter! All I did was offer you a Pressman’s solution to get the press running. I should have read Bob’s post before suggesting mine. I believe Bob is correct with his estimate to the problem. In fact, because of Bob’s suggestion, I took my two presses apart that have the washer and found the small gears have significantly worn. I will contact you later when I have the parts to fix your shaft. Special thanks to Bob, not only did you help fix Brandi’s problem but you helped me fix my presses as well. Brandi………Thank you for the kind words! Thank You DGM, that is good information. I’m having the same issue with my Pearl. I’m intrigued by the the idea of replacing the gears but have no idea where to start. Are these sizes commonly found or are they custom? I’m wondering what others have done to fix this issue. Any advice would be great. In the meantime, I will try a washer. After Brandi’s situation and the discovery of my 2 Pearls in need of new gears. I had some newly manufactured. Unfortunately for me, I couldn’t have 2 cut, I have to go with 12, I have 10 left. I also had new shafts and pinions manufactured. Compete Shaft Set ups as seen in the photo above. Is that for the Pearl 3 or Pearl 11? I don’t know if they would be the same. I probably could use a new gear on my Pearl 11, though maybe best to replace the set, large and small gears. Wow! Would you be willing to sell any of your extras, Peter? Did you get multiples of the shaft and pinion too? I’m not sure if shipping is even feasible, but I’d be really interested. Bob, My apologies but I am fresh out of the NO 11 gears. I did have 8 of them manufactured but they went fast. All I have left are the NO 3 gears, shafts and pinions. Which surprisingly, I only used 2. Allison, I have all 3 pieces on the shelf, shipping is not a problem. Email me privately so I can give you the cost particulars in person.